BENGALURU: A 52-year-old woman died while seven others sustained burns after a speeding state transport bus caught fire on the busy NH 4 at Arishinakunte near Nelamangala, around 25 km from Bengaluru, on Monday night. The KSRTC bus with 37 passengers was on its way to Bengaluru from Chikkamagaluru. Around midnight, the driver and some passengers noticed fire at the rear end of the bus and alerted other passengers. By the time the vehicle came to a halt, the fire had spread across and passengers were jumping from windows and also from the driver’s seat. In ordinary transport buses, the main door as well as the emergency window are located on rear end of the bus. 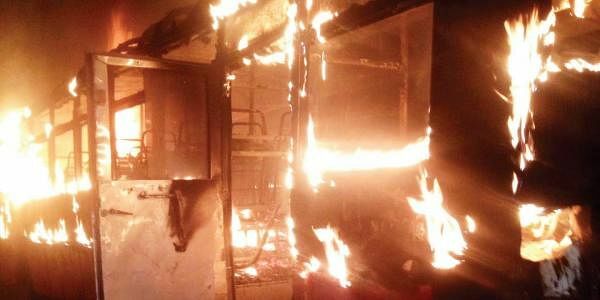 Bhagyamma, wife of Ramegowda, who attempted to get out from the driver’s door, could not escape as the fire caught up. She was a resident of Peenya. All the injured were taken to Victoria Hospital. The injured passengers are Mamatha (31) and her son Yeshwant (5), both residents of Kengeri; Dinesh, Padmanabh Shastry and Yashodamma. Mamatha’s condition is said to be serious as she suffered 80% burn injuries. The cause of fire is yet to be established though KSRTC officials have ruled out short circuit or tyre burst.